Brief Synopsis: The Monitors continue to discuss the history of the DC Multiverse. Issue Notes: Booster Gold appears in this issue only in flashback. Issues of Countdown are numbered backwards from 51. Therefore, this is the ninth issue of the series. Booster's appearance is in the back-up story in this issue. The main story, "The Funeral," details the funeral of the most recent Flash, Bart Allen. 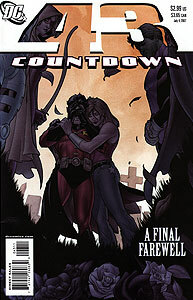 Issue Reprints: This issue has been collected in Countdown, Volume 1. 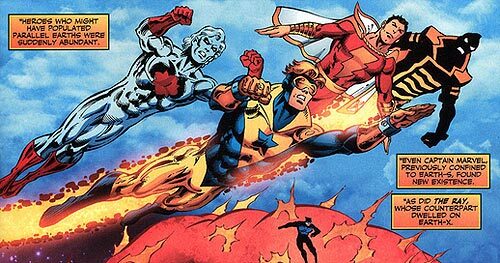 Booster Gold is shown in flashback flying beside Captain Atom, Captain Marvel, and the Ray. These other three characters were all licensed or purchased by DC Comics from other defunct comics publishers. Captain Atom, a Charleton Comics character licensed by DC Comics, and Captain Marvel, a character that DC Comics had been licensing from Fawcett Comics, were integrated into the DC Universe during Crisis on Infinite Earths. (Captain Marvel had been previously published by DC Comics, but his adventures were set away from the continuity of the DC Universe on the alternate world called Earth-S.) The second Ray did not debut until several years after Crisis, but it was the events of the Crisis that folded the character's father, the original Ray, a Quality Comics character, into the DC Universe. Only Booster Gold is a DC Comics character with no ties to a rival comic book publisher or the events occurring before or during the Crisis on Infinite Earths.